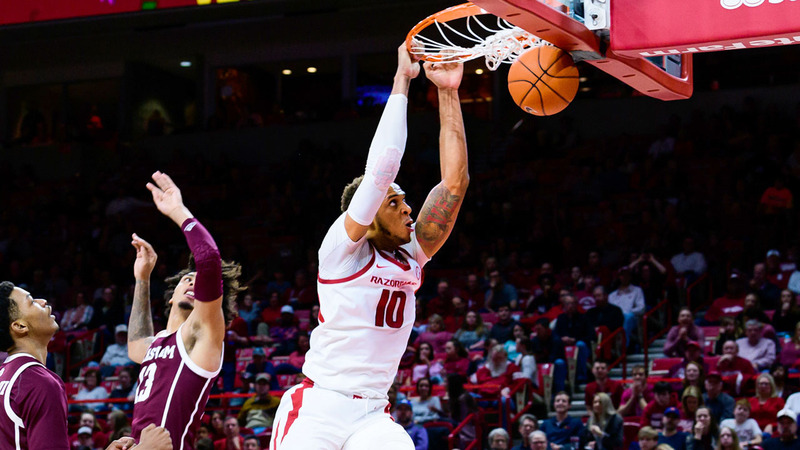 FAYETTEVILLE – Arkansas head men’s basketball coach Mike Anderson announced Monday that sophomore Daniel Gafford will forego his remaining eligibility and declare for the 2019 NBA Draft. Gafford will not participate with the Razorbacks in the upcoming National Invitation Tournament. Gafford (El Dorado) was a consensus first team All-SEC pick this season as well as being named to the SEC All-Defensive Team. In addition, he is a top 10 finalist for the Kareem Abdul-Jabbar Award. Gafford is the only player in the SEC to rank among the top five in both scoring (4th, 16.9) and rebounding (2nd, 8.7) as well as being the only player to rank among the top five scoring, rebounding, field goal percentage (1st, .650), blocked shots (3rd, 2.0), offensive rebounds (2nd, 2.8) and defensive rebounds (3rd, 5.8). Gafford ends his Razorback career with 955 points (14.3 ppg), averaging 7.4 rebounds and blocking 141 shots while shooting 63.5 percent from the field. In SEC games only, Gafford shot a school-record 62.1 percent (213-of-343) for his career from the field, 32 percentage points better than second place on the list (.589 by Corliss Williamson). In all games, Gafford’s career .635 field goal percentage overall ranks second in school history, just missing the school mark of .636 by Oliver Miller. Gafford’s career 7.4 rebound average ranks seventh in school history. Gafford’s career 141 blocked shots ranks sixth in school history. The NBA Draft is set for June 20 in New York City. In the history of the NBA Draft, 37 Razorbacks have been selected, including 12 in the first round with the last coming in 2015 when Bobby Portis was taken 22nd overall by the Chicago Bulls.